Following years of heavy backpacks and overloaded suitcases, I believe I have perfected the art of packing light. Arguably no other thing annoyed me more than lugging a heavy bag around the world. The last straw was in 2013. My family and I were on an eight-month South American tour where I insisted on bringing an extra 29-inch wheeled duffel bag filled with bedsheets, pillow cases, and plush towels. In my ignorance, I thought I would need the items in case the apartments, hotels, hostels and campsites did not have them. It turned out that we only used those bedsheets, towels and pillow cases during just one week out of our entire 8-month journey. If you must bring a towel, instead of packing a standard cotton towel, take a lightweight microfiber one, like the Sea to Summit Dry Lite Towel, which weighs only 5.1 ounces yet is still large enough to wrap around your body. Another option is the 5-ounce Eagle Creek Travel Towel. I own and have traveled with both of these towels extensively and they are about 75% lighter than most standard cotton bath towels. This same principle applies to clothing also. When traveling to cold destinations, pack lightweight down jackets rather than bulky, synthetic insulated jackets. High quality down has a much better warmth-to-weight ratio than synthetic insulations, meaning you’ll be just as warm even if your jacket is much lighter weight. Nowadays, the Latitude 56 RW_02 Road Warrior Carry-on is my go to suitcase for overnight to three week long trips. Although there is less space than in a check-in sized bag, I find it much more convenient to snugly fit all my essentials into one carry on sized bag, since I don’t have to wait at the baggage carousel, pay extra fees, or worry about an airline potentially losing my bag. I travel with the Latitude 56 RW_02 because of its four smooth spinner wheels, durable telescoping handle, and sharp business looks. It weighs 8.1 pounds when empty, which is a little heavier than other carry-ons like the Delsey Chatillon, which weighs 4.6 lbs. Both carry-on bags mentioned here meet the IATA (International Air Transport Association) approved carry-on size of 55 x 35 x 20 cm (or 21.5 x 13.5 x 7.5 inches). Please note that carry-on size limits vary from airline to airline, but the general benchmark is the IATA approved size. Of course, there is nothing wrong with checking your luggage in or carrying a larger suitcase. Checking in frees you up from rolling your suitcase all over the airport. You’ll have extra room to bring home the souvenirs too. 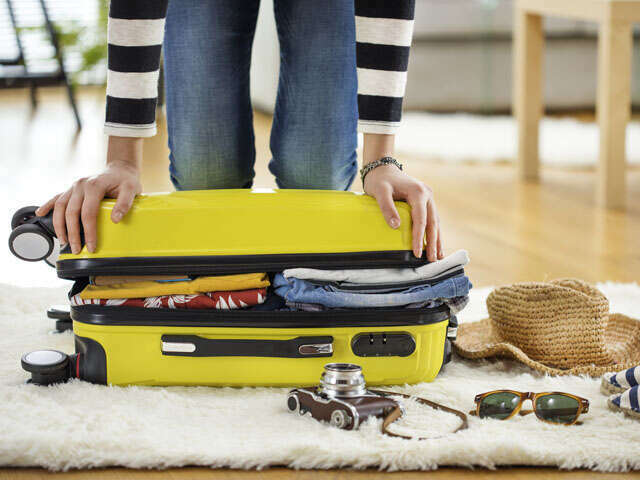 Before traveling, check your airline’s luggage weight and size limits. Recently I discovered the BeeGreen Reusable Shopping Bag, which weighs only 1.6 ounces with an open size of 20 by 16.5 inches. This multi-purpose bag is a must have for shopping, going to the beach, and it functions as a spare ‘luggage’ just in case I need another bag for things I bought during the vacation. No need to bring an extra luggage or a bigger bag for things purchased overseas. I will have to check in my carry-on suitcase if this foldable shopping bag becomes my carry-on bag. Most airlines on international flights do not charge a fee for the first check in bag. In addition to a carry-on, airlines allow a personal bag on board the plane. Personal bags can hold more things than you can imagine. Your personal bag must fit under the seat in front of you. Choose a large purse, laptop bag, small backpack or a messenger bag as your personal bag. I have the TOMS Trekker messenger bag as a personal bag to carry my passport, wallet, iPhone, phone charger, scarf, travel-sized notebook, a quart-size 3-1-1 liquid bag, several pens, headphones, travel converter and adapter, snack bars, and a small reusable water bottle. Personal bags are a perfect complement to a carry-on. Liquids Rule. You are allowed to bring a quart-sized bag of liquids, aerosols, gels, creams and pastes in your carry-on bag and through the checkpoint. These are limited to travel-sized containers that are 3.4 ounces (100 milliliters) or less per item. Most travel sized toiletries are readily available in drugstores and online. I usually reuse old hotel shampoo and shower gel bottles and fill them with my favorite liquid face wash and hair oil. It is not necessary to bring shampoo, soap, and conditioner unless you are picky or have sensitive skin. Most hotels and even Airbnb apartments are well-stocked with good shampoo and soap. Before I leave for vacation, I download my favorite eBooks on the Kindle app on my iPhone, and I borrow eBooks from my local library and read them through the OverDrive app. So, all my books are on my iPhone 6s Plus. If you want to read physical books or magazines, I’ve discovered airlines like Virgin Atlantic and Qatar Airways offer free magazines at the general waiting areas. If you’re planning to attend a concert or eat in fancy restaurants and need a beautiful clutch bag, try getting one that functions as a wallet too. The 5 by 7.25 inches Daria Convertible Leather Crossbody Clutch has a detachable wrist strap and optional chain crossbody strap attachment. It has a zip wall pocket, 1 slip pocket, and 3 card slots. Marie Kondo, the Japanese decluttering expert who wrote the best-selling book, The Life-Changing Magic of Tidying Up created the KonMari Folding Method for folding all clothing items. Read The Illustrated Guide to the KonMari Folding Method article in Goop.com for illustrated guide to folding socks, underwear, pants, t-shirts, and sweaters. Her method helps me pack neatly and choose only the items I love and will use regularly when on a trip. Now instead of rolling my clothes, I use the KonMari Folding Method, and I arrange the first layer of items side by side in vertical positions. My clothes are easy to get to and identify. I wash fast drying clothes in the hotel room sink and take advantage of the hotel laundry service too. When in doubt about what to bring and what not to bring in your carry-on, download the MyTSA app on your smartphone. If you have a pressing question, MyTSA has an AskTSA feature where you can either call, Tweet or Facebook Message to get live assistance from 8 a.m. to 10 p.m. Eastern Time on weekdays and 9 a.m. to 7 p.m. on weekends and holidays.